2 In this Case, 7500 p.m. per vehicle is treated as Income. 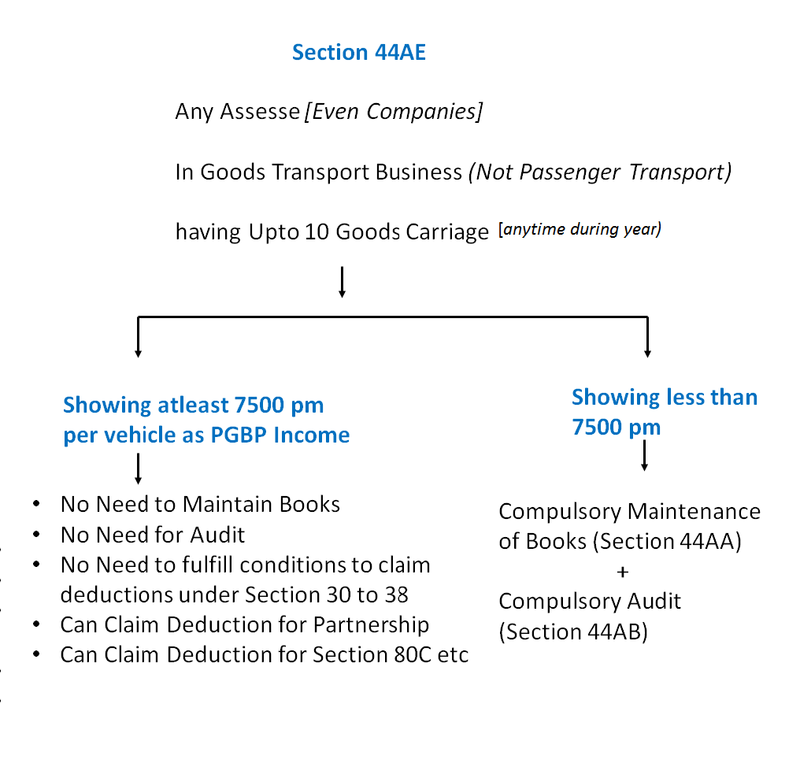 What is PGBP Income as per Section 44AE? Can in Case 1,assessee show PGBP income of 300000 in ITR ? Can in Case 2,assessee show PGBP income of 200000 in ITR ? Yes, but he has to compulsory maintain books of accounts and get the accounts audited under Section 44AB. Can in Case 3,assessee show loss of 100000 in ITR ? Mr. X commenced the business of operating goods vehicles on 1.4.2014. He purchased the following vehicles during the P.Y.2014-15. Compute his income under section 44AE for A.Y.2015-16 Would your answer change if the two light goods vehicles purchased in April, 2014 were put to use only in July, 2014? Since Mr. X does not own more than 10 vehicles at any time during the previous year 2014-15, he is eligible to opt for presumptive taxation scheme under section 44AE. Rs 7,500 per month or part of month for which each goods carriage is owned by him would be deemed as his profits and gains from such goods carriage. Therefore, presumptive income of Mr. X under section 44AE for A.Y.2015-16 is Rs 5,47,500, being 73 × Rs 7,500. The answer would remain the same even if the two vehicles purchased in April, 2014 were put to use only in July, 2014, since the presumptive income of Rs 7,500 per month has to be calculated per month or part of the month for which the vehicle is owned by Mr. X. (5) If the assessee feels that his profit is less than 7500 p.m per vehicle, then he has to compulsory maintain books of accounts and get the accounts audited under Section 44AB. (6) They can claim other deduction like chapter VIA dedication (80C) etc. or section 40(b) Deduction for partners. (7) They also do not have to pay advance tax on this Income.